Extravagance is provided by being at the sea, river and lake fronts. The vast array of food, recreation facilities and activities will be second to none. Comprehensive, all-inclusive facilities catering to all 3 generations – from the infant to the elderly, from baby pools to water theme park to professional spa and massage services. Facing the Virgin Mangrove Forest. The Expansive Clubhouse of 48,000 sq.ft. Contains Virtually All That You Need In A Resort Residence. is one of the hallmarks of The Haven. A 5-Star Hotel Resort Operation. Lagoi Bay Haven, presented by PT The Haven Bintan, a subsidiary of Multi-Award Developer, Superboom Projects Sdn Bhd, is poised to be a landmark and model for the region. The first phase due for completion by the first quarter of 2022 will comprise two towers with 556 units. 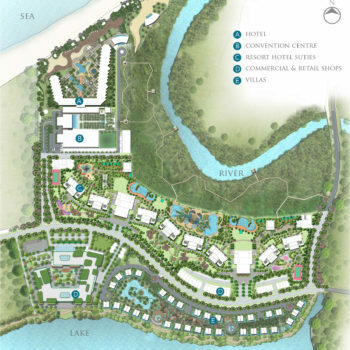 With further expansion in the pipeline, Lagoi Bay Haven sets out to be the most desired resort development in Indonesia. Your new home will be managed by PT The Haven Premier. The company is exclusively devoted to hotel management and the provision of quality 5-Star hotel services. The Haven Premier has been a major contributing factor to the success of The Haven Resort Hotel, Ipoh and in securing the hotel’s position on TripAdvisor Travellers’ Choice Award of Top 1% for four consecutive years, 2016 – 2019, and winner of 2017 Gold Circle Award from Agoda, amongst others for the hotel.